February 27, 2017 10:11 pm Leave a Comment	I am asked often what exercises for the upper body a patient can be doing that are beneficial. Here are three to consider! There are some great beneficial upper body exercises that are sometimes neglected because people do not see the benefits immediately, don’t know the benefits, have pain, or lack range of motion. The upper back and shoulder girdle could be considered the most neglected areas but are muscles used in almost all upper body movements. Show me a strong person that has a weak back and I’ll show you a powerlifter that loves cardio. Having a strong back means being strong in all movements, great posture, and healthy shoulders (shoulder pain/impingement is probably one of the biggest complaints for not doing certain movements). Here are some great exercises to help build that strong back and upper body. 1. Rows, rows, and more rows – Too many people focus on moving weight overhead or bench press and not focusing on enough rows. Rows of all sorts help create that strong basis, your back, to help support big weight and maintain an overall healthy upper body. Dumbbell rows, barbell rows, seated cable rows, and inverted rows are all great to bring into your exercise regime. If you are feeling a lack of strength in your back or your anterior body (chest) outperforms your posterior, add in rows twice a week with a 3-5 sets by 10-15 repetitions. Change up the type of row you do or the type of grip you have (over, under, neutral). 2. Incline Bench Press – A movement that is not too popular because you can’t get as much as on the flat bench! This movement is one of my favorite especially trying to build up the muscles in the upper chest or for those trying to lose some flab in the armpit/chest area. Typically, I keep the weight moderate and really try to stretch the pectoral muscles to get a deep contraction. Make sure to choose a weight that will allow you to make the bar touch your upper chest which will give you that deep pectoral stretch. 3-4 sets with 8-10 repetitions here at least once a week. 3. Face Pulls – Under used and underappreciated exercise but has been a staple of many heavy benchers. This can be done on a cable machine with a rope attachment or with a mini band, which I prefer. Have the band or cable right above eye level. You are going to pull the rope or band directly towards your face while flaring your elbows back and out. I always think of it as putting on glasses with the band or rope. This will help build the upper back and create healthy mobilized shoulders. 3-4 sets with 12-20 repetitions at least twice a week – try this as a burnout towards the end of your workout. January 9, 2017 9:40 pm Leave a Comment	The good morning is an underrated and underutilized movement. Used correctly, they provide a strong, healthy posterior chain (PC), more importantly targeting the lower back. Many people have a stigma using the good mornings because they say it hurts their back, but that is probably from 1) lack of mobility or 2) too much weight – which is causing bad form. 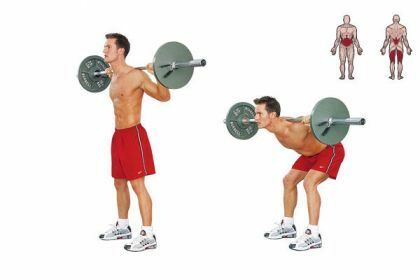 The good morning is a great variation of lower body exercises to utilize in strengthening one of the weakest and underdeveloped areas in most people – the posterior chain. Here is how to effectively use the good morning is creating a stronger PC. 1. Dealing with lack of mobility – if you suffer from a lack of mobility where you cannot keep the spine neutral and back flat during the movement, try by first pushing the hips back and lower yourself to a position where your back is not rounding. The back, core, and glutes should all be firing and engaged during the movement staying as tight as you can to maintain a good position. Imagine your entire body as a lever during the movement. Depth will come from mobilizing, but what is most important here, is staying in a position that will not compromise the movement itself. 2. Too much weight – Dropping the ego at the door is one of the hardest things for us to do. We want to smash big weights, out lift the person next to us, or not lift what we think we should be doing. Good mornings need to be used to help develop the squat and deadlift; hence, using a weight that is heavy but good form can still be used. General rule of thumb is 50% of bodyweight for the load and 6-10 repetitions for 2-4 sets. 3. Change up the stance – different stances can be used to target different muscles within the posterior chain. Try one week of close stance then another of wide or even sitting on a box. This can be done on a week by week basis or change it up for each set. 4. How often should they be done – this will vary on how strong your PC is and how much benefit you get from the good morning. Generally, these should be done once every 2-3 weeks to help keep strength in this position. If you notice your PC is weak and are getting great benefits from the movement, this could be done once a week. The good morning should be used as an accessory movement and should be used after your main lift because of the stress it puts on the back and hips. August 10, 2016 5:04 pm Leave a Comment	Staring at the computer for 8 hours a day, going home and sitting to watch TV, looking down at your phone, but you work out for an hour a day. That’s not enough to fix the other 14 hours that you are hurting your posture. That’s where the lacrosse is a miracle in addition to a great posture throughout the day. Here are some upper thoracic muscle groups to mobilize with the lacrosse ball. 1. Trapezius – Facing a corner of a wall, put the lacrosse ball on the wall and trigger point above the collar bone right on the trapezius both on the anterior and posterior sides. The trapezius gets strained and locked up a lot from hunching over, staring down, and the head not being in a stable position. Once you have the trapezius trigger pointed, try moving your head slowly in all directions – hold in one spot and try moving your arm around in all directions. 2. Pecs – Facing a wall, pull the lacrosse ball on the wall and trigger point below the collar bone on the upper pec. This area gets jammed up from hunching over and also a lot of “Bro” workouts – bench press only! Move around on the lacrosse ball side to side and then up and down trying to find really deep points and move your arm after you find that sweet spot. 3. Shoulder blades – Lying on the ground, place the lacrosse ball on your back starting at the first rib (right at the top of the trapezius) moving all the way down the shoulder blade. The ball is going to move down your back between your shoulder blade and spine and spend time mobilizing at each rib. Start with your arm pointing at the sky and at each rib, move your arm back and forth and then in all areas until you get to the bottom of the shoulder blade.